DeWayne Michael Purman was born on August 20, 1966 in Alhambra, Illinois. DeWayne passed from natural causes on November 12, 2016 in Larimer County. More than anything, DeWayne loved and will always love his wife, children and family. Whenever anyone would take a picture of him for Kari, he always asked – “Do I look cute?” He would call her 20 times a day, every day just to tell her he loved her. 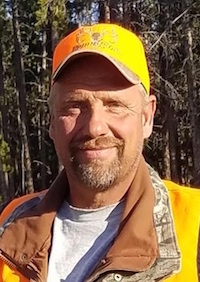 At the time of his untimely death, DeWayne was in a favorite hunting area in remote Larimer County. Three of his children were with him as he left this earth doing what he loved – chasing deer. DeWayne, his wife and his children all enjoyed hunting together. The children learned many lessons from these adventures, lessons that will make them smarter and tougher for life. He worked for Little Thompson Water District, helping to ensure the safe and effective delivery of fresh water to the Berthoud area, a responsibility he took seriously, and also owned and operated K & D Landscape and Snow Removal Company, a passionate addition to his work life – helping others enjoy growing grass, shrubs and trees and enduring landscapes. DeWayne will always be known for his strength, his, his work ethic, and his smile, his humbleness, and his love for life. DeWayne is survived by his loving wife, Kari, children Danielle Jones (Jason), Taylor Dean (Anthony), Bailey Rose, Robert, Garrett, and Josh, and two lovely granddaughters. His parents, Harvey and Marjorie of Loveland, sisters; Pam Rud of Fort Collins, Cathy Shaw of Highland, Illinois, Tara Morrison of Loveland, Kara Warden of Windsor, Rose Northway of Beecher City, Illinois, Teresa Balmer of Villa Grove, Illinois, and Karen Maxwell of Villa Grove, Illinois, brothers; Kenneth Fulk of Camargo, Illinois and Jim Fulk of Charleston, Illinois. A celebration of DeWayne’s life and an opportunity to share our memories together will be held on Thursday, November 17th at 4:00 p.m. at Good Shepherd Church, 3429 N. Monroe, Loveland with a reception to immediacy following at Brookside Gardens, 619 E. Co. Rd. 8 Berthoud. In lieu of flowers donations in his memory can be made to the “Dewayne Purman Family Fund“ at his gofundme page online. Please, leave the family a condolence at VesseyFuneralService.